Trace Cyrus, Miley's Older Brother, Shows Off Scalp TattooDid Miley Cyrus get her tattoo inspiration from her older brother? Or was it her father? 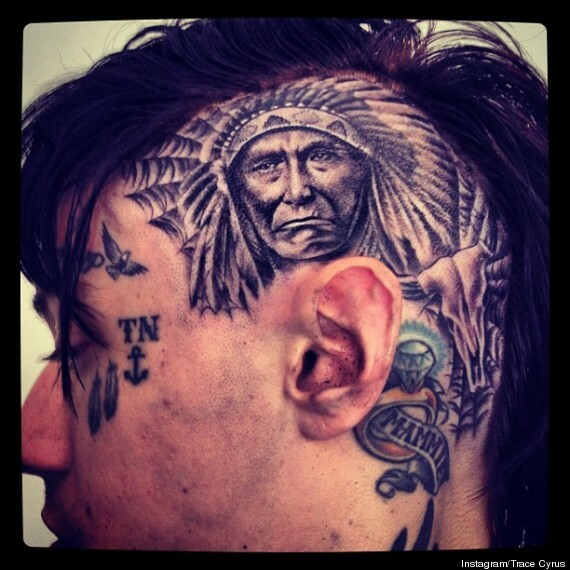 The pop singer's older brother, Trace Cyrus, showed off an intense tattoo of a Native American chief that he had inked on his scalp--just one of many tattoos the 23-year-old singer and designer has all over his body, including wrist-to-shoulder sleeves, neck and face tattoos.Comment: Miley's brother gets a Plains chief to honor his Cherokee ancestors from a thousand miles away. Are the Cyrus siblings really Cherokee? If their claims are accurate, they're in Johnny Depp territory (1/8 by blood), which puts them ahead of Elvis Presley and Elizabeth Warren. P.S. I think I'll get me a tattoo of a Greek in a toga to honor my British ancestors. Or a tattoo of a matador to honor my German ancestors. For more on the subject, see Billy Ray Cyrus Gets Native Tattoos and Miley Cyrus, Cherokee? Let me just say, from a style perspective, worst. Tattoo. Ever.